Click here to see our youtube channel for videos. 50 – 100 rounds of your chosen caliber or more. Signups start at 4:00 pm. Safety and course briefing will be gone over periodically as people arrive. Shooting will begin as soon as course is set up and continue until 9:00 pm. Every shooter will get two runs on the course. If paying up front the cost for all four weeks is $40, breaks down to $10 per event. There are many basic safety and match competition rules, but the primary safety rules are listed below. 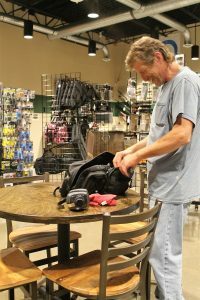 Remember, safety must be YOUR first concern as we are competing with real guns and ammo and when done in an unsafe manner can cause serious injury or worse. So for that reason a safety infraction carries the very harsh penalty of “disqualification,” or match DQ. This means you must put your gun away and will not be allowed to continue the competition. For egregious infractions, you may be asked not to return. 180 Degree rule: Allowing the muzzle of your gun to break the 180-degree plane (an imaginary plane based on a line straight down the middle of the range/stage and 90 degrees perpendicular in either direction, left or right, as viewed by the shooter) failure to comply results in a match disqualification. 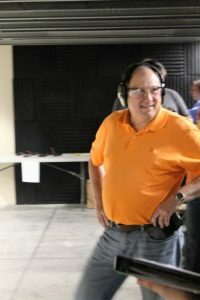 Finger in trigger guard while loading, reloading, moving with a loaded firearm (and NOT engaging targets). During many courses of fire, you will be required to move or reload between different shooting positions with a loaded weapon. 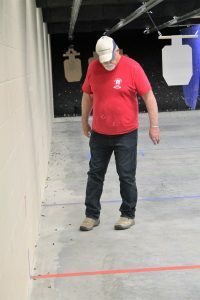 New shooters are encouraged to walk first and focus more on accuracy (and safety!) than speed, but you may run if you can safely do so. One of the primary safety rules for this situation is that your trigger finger must be well clear of (and visible to the R.O.) the trigger guard. If he sees that you have your finger inside of the trigger guard he may (but is not required to) shout a warning of “finger” or “trigger.” If you fail to comply with a safety rule you will be stopped and disqualified from the match. Sweeping: Sweeping is when you allow the muzzle of your loaded gun to point towards any part of your body (hand, leg, foot). Obviously, this would be a match DQ. Accidental Discharge: Basically, means that you allowed the gun to fire in an unsafe manner or direction. Usually associated with the gun going off while drawing or reloading or a round that is fired outside of the boundaries of the range or a round fired while you were not actually purposely engaging a target. 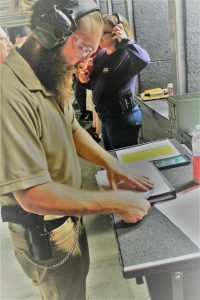 Handling of a firearm: Again, you may NOT handle your firearm at anytime unless under the direct supervision of an R.O. or in a safety area. Math behind scoring: points / time=HF(hit factor), your HF / the highest HF=the percentage of total points in the sage that you get, your % * the total stage points gives you your stage score. 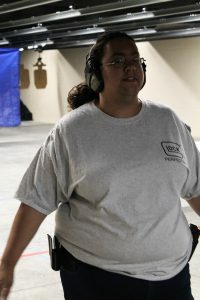 For further information and complete rules check out the official USPSA hand book at (HERE), this is not a USPSA event but using a USPSA format so we use most rules and or procedures as so many are already familiar with them. Each stage consists of 5 to 7 targets that are shot 4 times, 1 plate will be designate the stop plat. Each of the standard targets must be hit at least once before hitting the stop plate, and the time stops when the stop plate is hit. 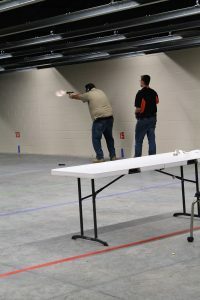 Participants may fire as many rounds as they deem necessary or until the firearm is empty. The worst time on each stage will be thrown out, and the total of the 3 remaining times will be the participants score. Each missed target will get a 2 second penalty. Failure to finish the course of fire during a string or not hitting the stop plate results in a 30 second penalty time for that string. The maximum score for any string is 30 seconds, no matter how many misses or penalties may have been accrued during the string. There will be a total of 4 stages. First shots will be at 12:00pm and run till the last competitor is done. Finger in trigger: guard while loading, reloading, moving with a loaded firearm (and NOT engaging targets). During many courses of fire, you will be required to move or reload between different shooting positions with a loaded weapon. 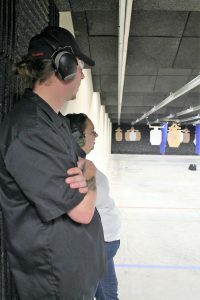 New shooters are encouraged to walk first and focus more on accuracy (and safety!) than speed, but you may run if you can safely do so. One of the primary safety rules for this situation is that your trigger finger must be well clear of (and visible to the R.O.) the trigger guard. 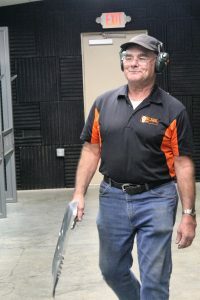 If he sees that you have your finger inside of the trigger guard he may (but is not required to) shout a warning of “finger” or “trigger.” If you fail to comply with a safety rule you will be stopped and disqualified from the match. For further information and complete rules check out the official NSSF Rimfire challenge hand book at (HERE), this is not a NSSF event but using a NSSF format so we use most rules and or procedures as so many are already familiar with them. 7yrs- 17yrs must be accompanied by a parent or guardian with a valid shooter card. There are two divisions, irons and optics. This division is for the shooters that like to shoot with optics. Optics may have up to 9 times magnification, 1-9×40 for example. Target: The target used for optics division is the know your limits seen to the left. Shooter will shoot a total of 10 round per target 5 on top, 5 on bottom. 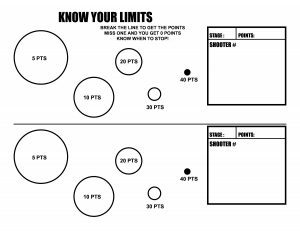 Rules for the know your limit target are break the line to get the points, miss one and you get 0 points know when to stop. 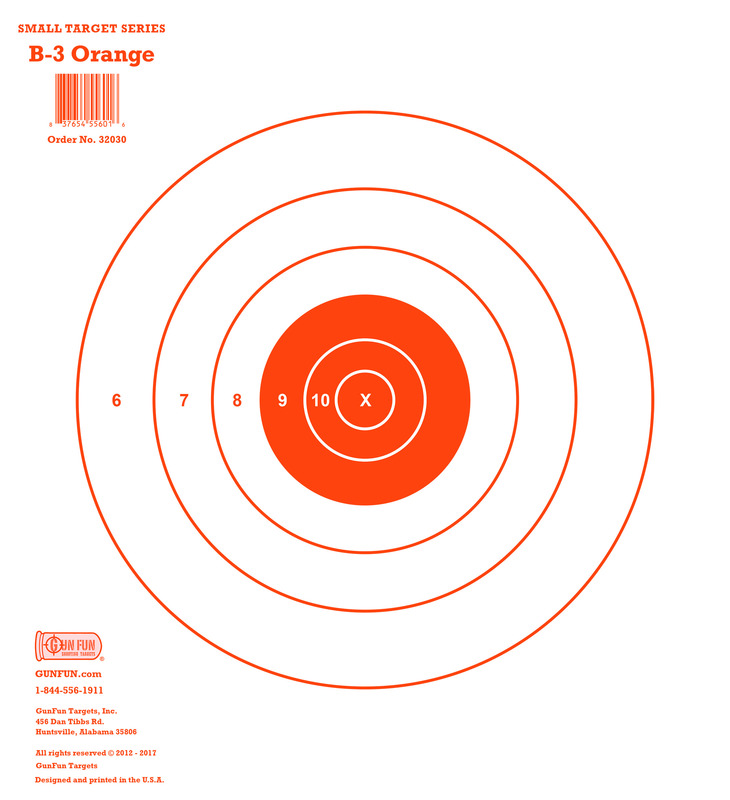 You may choose which point circles you want to shoot with a total of 5 round. 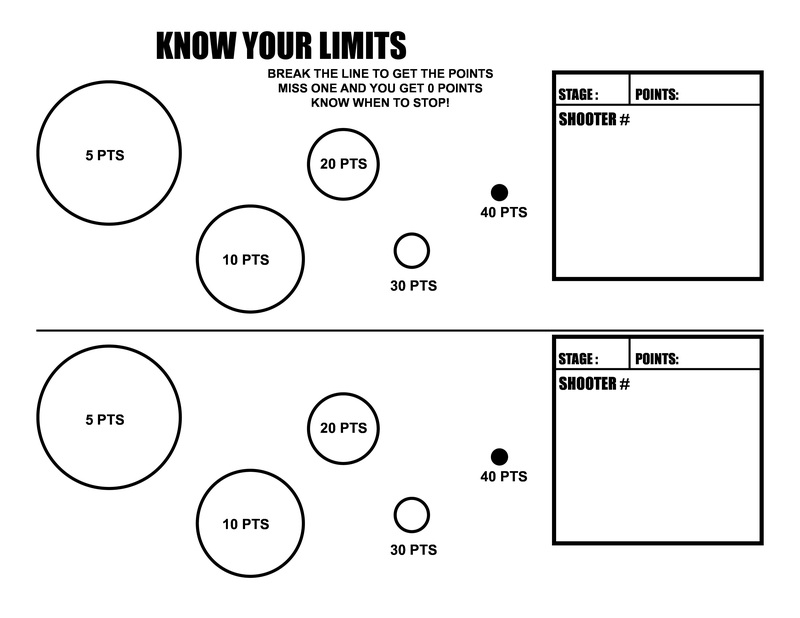 (for example, you can shoot the 5pts once, 10pts once, and 20pts 3 times.) your score is totaled up, highest point total is the winner. This division is for the shooter that use iron sights or peep sights. Iron sights or peep sights only no optics. Target: this division is very straight forward using a standard B-3 target as seen to the left and will have 5 shots fired with the target at 15yrds and 5 shots fired with the target at 25yrds for a total of 10 shots per target. Scoring is an accumulation of points earned per scoring zone. 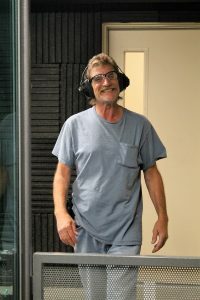 Are you looking to break away from the normal practice? Maybe looking for something for you and the kids to do, or just want to try something new. Well we have something in store for you. Our CIN-City GLOSHOOT transforms your typical in a stall shooting experience into something totally different. For this event we turn off the lights and turn on the UV BLACK LIGHTS giving our special UV reactive targets a glowing effect. Do you have Night Sights or Fiber optic sights? It turns out that the UV Black Lights both enhance and super charges them for long after you leave the range. 2) Lane free to HDR membership holder themselves, thus only needing to purchase your targets and extra shooter(s) where applicable. 3) Walk-in welcome you just need to purchase lane time and targets. With the purchase of any NIGHT SIGHTS or Fiber optic sights during the GloShoot, will include a voucher for a FREE sight install for your new SIGHTS. Only valid with event participation. This event is to shoot under black light. Sight installs can only be done that day if before 6pm. Voucher good for 60 days. Come in and try your ZOMBIE killing skills! 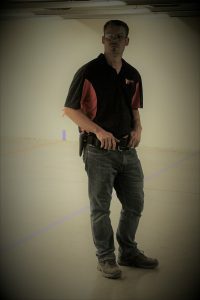 Join us for IDPA, safety briefing starts at 5:30 PM first shots will be around 6 PM on every First and Third Tuesday of every month. Every shooter is required to go through the safety briefing. These events are open to new and experienced shooters and is a great way to gain experience and test your shooting skills. Click here For the official IDPA website. Click here for match signups just scroll down the list to find the match that you are signing up for.